My neighborhood is lined with cobblestone streets and brick sidewalks. As you might imagine, the old chipped bricks make for an uneven walking surface. And over the years, I’ve ruined more than one pair of high heels. So I’ve learned to watch where I step. I’m not sure how long the brick had been in place when it caught my eye. But each day as I walk by, I feel compelled to check and see if the brick is still there. 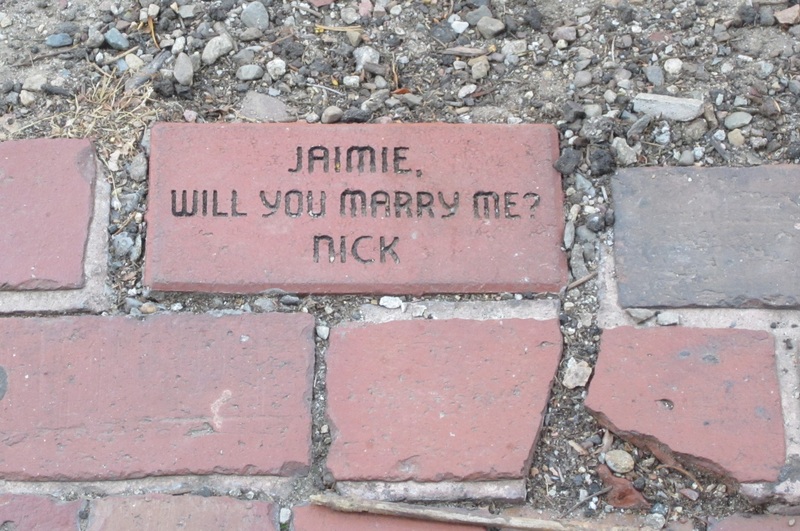 It’s become a wildly romantic mystery to me as I spin all sorts of stories about how the brick came to be in this spot, as well as my speculations about this couple – Jaimie and Nick. Do I know them by sight? Maybe they live right across the street from me. Is Jaimie a woman or a man? Have they gotten married? So many questions remain unanswered. Why did Nick choose to propose in this way? How exactly did he plan his grand gesture? And what happened when Jaimie spotted the brick? If Jaimie accepted the proposal, wouldn’t they have dug up the brick as a memento? Likewise, if Jaimie rejected the proposal, wouldn’t Nick have dug it up and gotten rid of what would’ve become a painful reminder? Either way, why does the brick remain? Update: One morning, as my downstairs neighbor and I left for work at the same time, we walked together down Dartmouth Street. When I pointed out the brick and confessed that I was intrigued by it, she told me that her husband had witnessed the proposal. “Tell me everything!” I pleaded. Jaimie is a young woman, and Nick a young man, she confirmed. Whether Jaimie saw the brick at first or not remains to be seen. But when Nick got down on one knee in the traditional pose, my neighbor, right along with Jaimie, realized what was about to happen. My neighbor didn’t want to impose on such a personal and meaningful moment so he quickly turned the corner and got out of sight. “That’s it? That’s all you know!” I persisted. “My husband assumed she said yes,” she replied. More than ever, I believe Jaimie and Nick are together and living happily ever after. This uncommon proposal has piqued my curiosity and I may never know the story behind it. But I’d like to think that Jaimie and Nick are together and living happily ever after.